Have you ever heard of the buzzword, umami, but aren’t quite sure what it exactly means? Most people generally do not recognize the umami flavor while eating due to its subtle and mild taste. Umami, discover in 1908 by Japanese Dr. Kikuknea Ikeada, is a Japanese word meaning “pleasant savory taste.” Presently, it is the fifth taste among the original tastes of sweet, sour, bitter, and salty. As a result of receptors for the amino acid called glutamate, we are able to taste umami. 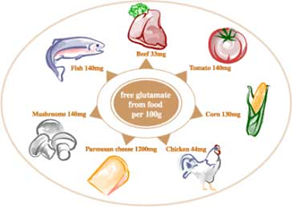 Glutamate occurs naturally in fish, meat, vegetables, and dairy products. It’s also available as its salt form in MSG. Cooking and fermentation helps release this amino acid to experience the umami flavor. Similar to glutamate, the umami flavor is conveyed by certain compounds found in meats and vegetables. When combined in a dish, such as a mouthwatering cheeseburger with ketchup, umami complexes heighten the flavor. 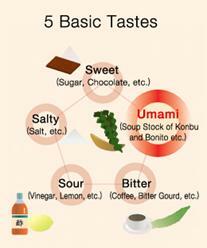 Umami has distinct taste receptors found all over the tongue – now that’s impressive! A remarkable amount of foods are rich in umami, including: tuna, cod, seaweed, shellfish, tomatoes, truffles, soybeans, carrots, shiitake mushrooms, green tea, soy sauce, parmesan cheese, meats, poultry and even breast milk. Thus, umami is an extraordinarily diverse taste category, and impacts a vast majority of one’s daily food intake. Next time you cook up some shiitake mushrooms or have the urge to lather your sushi with soy sauce, remember, your meal would not be the same without the savory umami flavor.